Not losing weight? Is your Thyroid Gland Responsible? You are following a balanced diet, exercising every single day, avoiding eating out, doing every possible thing for losing weight. But, the weight doesn't budge. You must be wondering what might be going wrong. 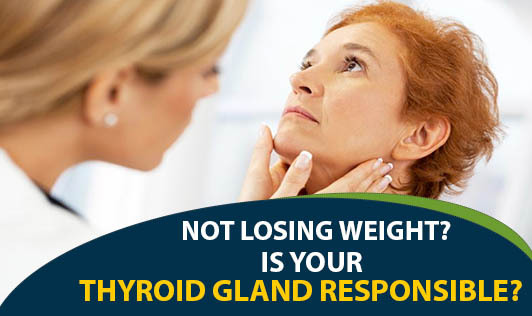 You probably might be suffering from hypothyroidism. Hypothyroidism is a condition in which your thyroid gland secretes abnormally less thyroid hormone. This leads to an overall sluggish metabolism. Fatigue, Constipation, dry and pale skin, brittle nails, hoarseness of voice, muscle weakness, joint pain, slow speech, slow thinking, decreased concentration, sensitivity to cold, decreased sweating, heavy menstrual cycles, puffy face and hands.... And most importantly unexplained weight gain! It can be treated with medications, and proper diet and physical activity will definitely help in controlling some of the above mentioned signs. So, if you are experiencing these signs, it’s time to get your thyroid levels checked. And if you are diagnosed with Hypothyroidism, consult the experts including your Physician, Dietician and Physiotherapist (for guidance on exercises).